A deactivated cyborg is revived and rebuilt with no memory of her past so goes on a quest to learn the truth about herself in Robert Rodriguez’ Alita: Battle Angel. Adaptations of Japanese Anime and Manga have been fairly poorly received over the years. The most recent example was Ghost in the Shell; a film met with mixed reactions. Audiences would be forgiven for thinking that such things couldn’t be successfully adapted for a modern audience. I personally have next to no experience with anime or manga so it’s hard for me to gauge how successful adaptations are but I can discuss their merits as films and whether or not they work in their own right. Alita: Battle Angel isn’t half bad all told. The characters are easy to latch onto, there’s nothing complicated about the story and it’s very impressive on a technical level so as a cinematic viewing experience there are certainly far worse. It’ll never set the world on fire with originality or nuance but there’s enough here to keep the attention of the viewer until the credits roll. Alita (Rosa Salazar) is a discarded cyborg found and repaired by Dr. Dyson Ido (Christoph Waltz). She awakens with no memory of her past and a wide eyed -literally- curiosity about the world around her. She is a newborn baby in the body of a cyborg teenager and her giant eyes are the audience’s window into the world this film occupies. Rosa Salazar is immediately likeable in the lead role and Alita’s growth from naivety to some level of understanding of the world around her feels natural enough. Each of her lessons are clearly laid out and meaningful to her on a personal level. The glimpses of her past end up feeling unnecessary in the grand scheme of things as the script never quite finds a way to make her past meaningful to her new life but they do serve as a reminder that she is missing a significant part of herself. Her relationship with Dr. Ido is the emotional core of the film and it’s constantly endearing. Ido sees her as a second chance to have a daughter after dealing with the loss of his own but he’s also overprotective to a concerning degree. This is made abundantly clear through choosing the name Alita and is backed up by his behaviour early on. The tenuous quality to the relationship works really well and makes great use of Alita’s perspective as it is constantly suggested that Dr. Ido is hiding something from her even when he owns up about certain things. The give and take portrayed in their relationship throughout the film helps it feel more real and grounds the fantastical world in a relatable father/daughter dynamic. Christoph Waltz is always good value no matter what he turns his hand to and doesn’t disappoint here. There’s an effortless kindness to Dr. Ido as well as a deep sense of loss and regret attached to everything he does and says. His performance brings depth to what might otherwise have been a fairly shallow presence and adds more to the character than the relatively simplistic narrative requires of him. The subtle variances in the way he conducts himself really bring the character to life and make it easier to accept the more secretive aspects of his role in the story. 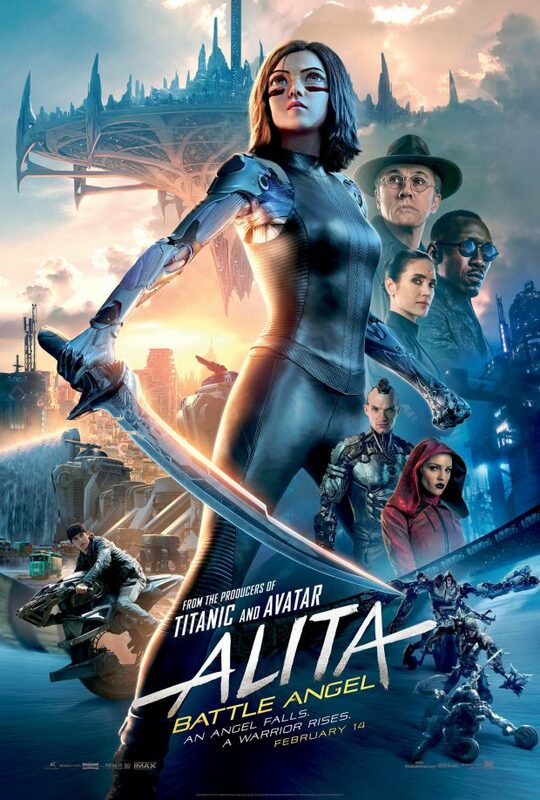 Alita’s other main connection is with Hugo (Keean Johnson) but it fails to be anything memorable. It starts with a meet cute with a sci-fi twist and he initially teaches her things about the world that Dr. Ido tries to protect her from. A big problem with this relationship is that Keean Johnson is really flat in the role and lacks chemistry with Rosa Salazar. It’s very difficult to buy into a romantic angle between them because it’s clearly only there to service the plot rather than growing organically out of the characters and their interactions. It doesn’t help that Hugo largely exists to provide Alita with whatever she needs for her story to progress to whatever it needs next. It’s a complete contrast to her more organic and endearing relationship with Dr. Ido and stands out because the handling of it is so much less sophisticated. The film is somewhat lacking in how it handles its villains. Mahershala Ali is as charismatic as ever but is given very little to do and suffers from forgettable motivations. Ed Skrein is visually imposing but fairly bland and similar can be said for Jackie Earle Haley. None of the actors playing the antagonists are bad but they are saddled with thin characterisation and a focus on how slick they look than how they come across. The simplicity of the plot is both a blessing and a curse. It’s clear that the film is in no hurry to reach any sort of climax because it would rather spend it’s time developing the characters and the world they live in. It’s a significant asset as there’s a great deal of focus on explaining how aspects of the world works and the places that various characters occupy in it. The trade-off is that the stakes feel muted and there isn’t an awful lot happening much of the time but the characters and world are certainly interesting enough on the whole to compensate for it. It’s fairly clear that this film was intended as the first in a series of films that likely won’t see the light of day judging by the box office performance. This film does have a resolution of sorts as the focus of the story is on Alita’s journey towards finding her place in the world which she definitely does by the end. Sequel stories are teased through a larger threat looming on the horizon and a vast chunk of the world left a mystery but the character story is very much resolved in readiness for taking on new challenges. This film really delivers on its visuals. The world around the characters is distinct, impressive and feels entirely lived in. A big feature is that Alita has anime eyes which makes her stand out from the other characters as something unique that doesn’t quite belong to her surroundings. It’s a simple visual trick that says a lot about her and ties into the overall theme of lacking a sense of belonging. There are also a number of set piece moments that are really impressive to watch. It helps greatly that the set pieces are varied in both pace and composition. A particular highlight is a really well choreographed bar room brawl. There is also a fast paced race sequence that is incredibly coherent and well put together. Based on the visual aesthetic and potential for exploration of the hinted at extent of this world along with all the scope there is for varied set pieces I’d love to see more of it. A technically impressive, character driven experience that does really well with world building but fails to craft a truly engaging story. The simplicity of the plot is an advantage and a disadvantage. On one hand there’s plenty of time to develop the world and focus on the characters but on the other the stakes feel muted with not an awful lot happening in the narrative. Alita is an engaging lead character wonderfully portrayed by Rosa Salazar and her core father/daughter relationship with Christoph Waltz’ Dr. Dyson Ido is really endearing. Christoph Waltz brings a lot to what could amount to a fairly shallow character and the constant shifts in the relationship make it feel more real against a fantastical backdrop. Unfortunately the romantic plot between Alita and Hugo is less than engaging and feels like a clumsy plot mechanic than anything else. This film does feel like the first chapter in a franchise we’ll likely never see but it makes up for that by fully resolving Alita’s character arc in preparation for taking on new challenges. Unfortunately the antagonists are really weak despite strong actors portraying them though they do lend themselves to some impressive set pieces. In general this film delivers some really impressive set pieces and there are a lot of really impressive visual flourishes making the world feel more lived in. Based on the visual aesthetic and potential for exploration of the hinted at extent of this world along with all the scope there is for varied set pieces I’d love to see more of it.